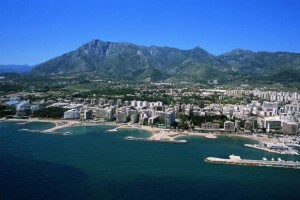 In its special setting protected by La Concha, the nickname given to the surrounding mountain range by its citizens, Marbella has become a byword for global tourism without losing any of its typical Andalucían flavour or its historic essence. Sea and mountain, tradition and modernity, a melting pot of cultures, all these unite in this Mediterranean city to offer the visitor an atmosphere rich in variety, one both multicultural and cosmopolitan, open to progress and a lifestyle rooted in the congeniality and welcoming nature of its people. Marbella is, simply, famous worldwide. Thanks to its geographical situation, it enjoys a pleasant year-round microclimate with an average daily temperature of 18.7C and generous sunshine twelve months of the year. Marbella’s microclimate is without doubt one of the charms of a city that is permanently bathed in sunlight, and underlies an internationalist tourism culture of great variety and full of possibilities. Marbella offers 26 kilometres of sandy beach, nearby mountains, 17 golf courses, numerous luxury hotels, beautiful countryside, four major marinas – among them the world-famous Puerto Banús – commercial and shopping centres and a vibrant nightlife. Ever since tourists began visiting the Costa del Sol, Marbella has been a byword for an elite form of tourism: from its beginnings as a tourism enclave in the mid-1960s and thanks to, among others, a visionary named José Luque Manzano, the empresario who built the first Fuerte hotel, in Marbella, in 1957, it has attracted actors, artists and personalities from all walks of life who have imbued it with a certain elegance, while themselves being drawn by its celebrations, fiestas and social life, many returning to spend more and more time here and not a few chosing to live in Marbella. To outline all that makes Marbella special, we have broken down this information into sections: Getting around, where to eat, what to do, Marbella for golfers, health and beauty, entertainment and shopping, and an extensive diary of events, church hours and pharmacies.